The teaching materials for the learning experience on “Prophets and Revelation” are divided into three parts. Part 3 includes a practice exercise that will help students apply the doctrine they learned from the Doctrinal Mastery Core Document, along with the doctrinal mastery passage found in Doctrine and Covenants 1:37–38. This lesson also includes a cumulative review of all the doctrinal mastery passages students have studied so far. Note: You could teach the practice exercise and the doctrinal mastery cumulative review in this lesson in a single class session or in two separate class sessions. Review with students the three principles from the “Acquiring Spiritual Knowledge” section of the Doctrinal Mastery Core Document: act in faith, examine concepts and questions with an eternal perspective, and seek further understanding through divinely appointed sources. How could you help John act in faith in seeking answers to his question? How could John’s testimony of prophets help him resolve this concern? How do you think you could help John examine his question with an eternal perspective? To help students seek further understanding through divinely appointed sources, give each student a copy of the accompanying handout. “It should be remembered that not every statement made by a Church leader, past or present, necessarily constitutes doctrine. It is commonly understood in the Church that a statement made by one leader on a single occasion often represents a personal, though well-considered, opinion, not meant to be official or binding for the whole Church. 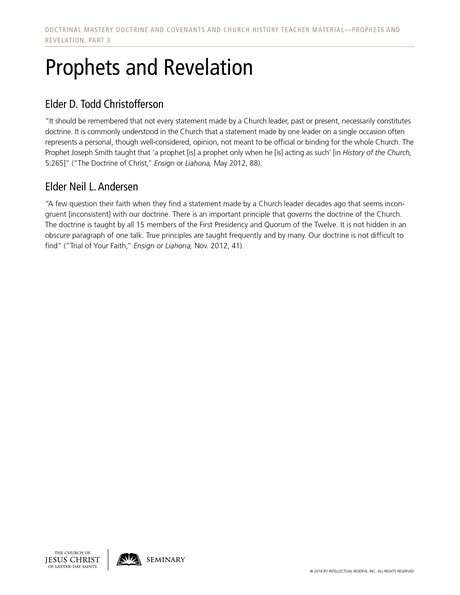 The Prophet Joseph Smith taught that ‘a prophet [is] a prophet only when he [is] acting as such’ [in History of the Church, 5:265]” (“The Doctrine of Christ,” Ensign or Liahona, May 2012, 88). “A few question their faith when they find a statement made by a Church leader decades ago that seems incongruent [inconsistent] with our doctrine. There is an important principle that governs the doctrine of the Church. The doctrine is taught by all 15 members of the First Presidency and Quorum of the Twelve. It is not hidden in an obscure paragraph of one talk. True principles are taught frequently and by many. Our doctrine is not difficult to find” (“Trial of Your Faith,” Ensign or Liahona, Nov. 2012, 41). How could these statements help John with his concern? After completing this exercise, help solidify what students have learned by inviting a male student to the front of the class, and have him pretend to be John. Ask this student to repeat John’s question by saying, “It seems like some statements from Church leaders contradict one another. If prophets speak for God, why don’t they always agree?” Invite class members to respond to this student (as if he were John) with what they could say to help resolve his concern. Consider inviting students to bear their testimony about the blessings of having prophets who receive modern-day revelation. Consider bearing your own testimony as well. Explain to students that you will say aloud the key phrase or the key statement of doctrine associated with that scripture. The student who has the scripture reference that matches that key phrase or key statement of truth then has five seconds to raise his or her hand. If the student is correct, do the same thing with another key phrase or key statement of truth. The goal is to see how many key phrases and key statements of truth the class can get correct consecutively. If there is time remaining after you lead the class through all the scripture references, invite students to trade cards with each other so they have a new scripture reference.